ST. LOUIS, MO. 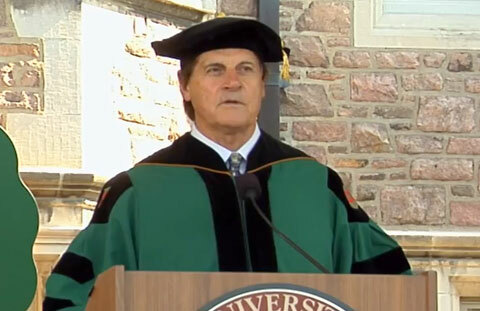 — Former MLB Manager, Tony LaRussa, recently gave the keynote speech to nearly 3,000 student graduates at Washington University in St. Louis on May 16 in Brookings Quadrangle on the Danforth Campus. La Russa told the graduates that young people must be willing to take chances as they begin their working lives. This was La Russa’s third time speaking at Washington University. He delivered an Assembly Series talk in 2005 and the keynote address at the William Greenleaf Eliot Society’s 45th annual dinner in 2012. Photo shows former St. Louis Cardinals manager, Tony LaRussa, speaking to nearly 3,000 student graduates at Washington University in St. Louis. Missouri on May 16, 2014. Chancellor Mark S. Wrighton had announced La Russa as the commencement speaker during the annual senior class toast on March 31 in Brookings Quadrangle. The 2014 graduation was the 153rd commencement for Washington University. Five honorary degrees were handed out, including one to H&R Block co-founder Henry W. Bloch and another to David E. Robertson, music director of the St. Louis Symphony. The following video shows former MLB manager, Tony La Russa, speaking to 3000 graduates at Washington University’s 153rd Commencement Ceremony in St. Louis . LaRussa is considered one of the best managers in baseball history. During his 33-year MLB career as a manager, La Russa won three World Series and 2,728 games, placing him third in all-time major league wins. He is the first manager to win multiple pennants in both the National and American Leagues and only the second manager to win the World Series in both leagues. He will be inducted to the Baseball Hall of Fame during ceremonies on July 27 in Cooperstown, N.Y., as well as to the St. Louis Cardinals Hall of Fame Museum on Aug. 16. Playing Field Promotions is a booking agent for motivational sports speakers and celebrities. If you would like to book athletes like Tony LaRussa for a speaking engagement, autograph signing, guest appearance, charity fundraiser or special corporate event, you can contact Tony LaRussa’s booking agent for appearance speaker fees or call 1.800.966.1380.